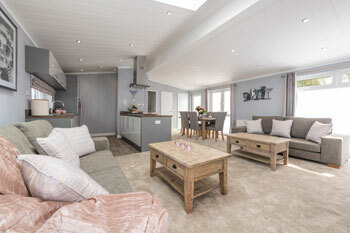 If you are after a light and contemporary luxury lodge with distinctive design features that provides practicality and true Omar luxury in equal measure, then the Alderney may well be exactly what you’re looking for. 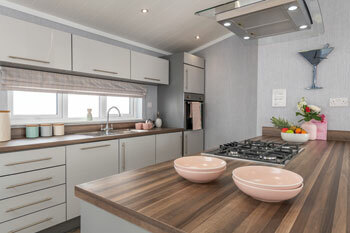 Launched at Hull’s Caravan Extravaganza in September 2018, we think this model will make a huge impact, offering extensive accommodation at a keen price point. In fact, when we heard about the price point, we were expecting something quite different; not a lodge with such an opulent feel. The Alderney boasts an engaging interior design – simple enough to appeal to all, yet with plenty of depth and interest, too. This is a model with pulling power! 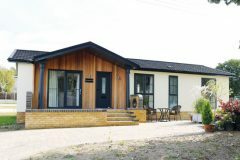 Inside, the accommodation includes a spacious living area with lounge, kitchen and dining areas – there’s a light and bright conservatory feel here due to the large picture windows and patio doors, too. 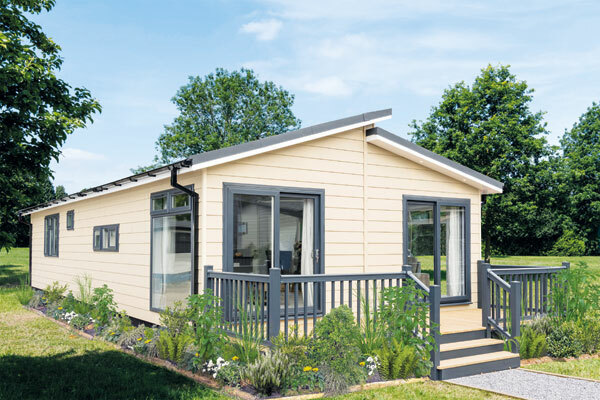 The model shown here is a 45ft x 20, with three bedrooms: a master bedroom with en suite; a second twin bedroom; and a third single bedroom/study. A family bathroom completes the arrangement. 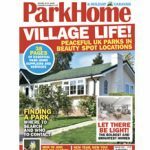 Other sizes available include two- or three-bedroom 50ft x 20s, a two bedroom 45ft x 20 with en suite and utility room, and a 40ft x 20 with two double bedrooms. The master has an en suite in all sizes. ● Two sets of patio doors, full height picture windows and skylight to lounge. ● Extensive range of integrated appliances in the kitchen. ● Illuminated mirrors and shaver points in bathrooms, full height mirrors to bedrooms. ● Two double bedrooms, and further flexible bedroom/study. ● Large combi-shower to en suite and shower over main bath.